It remains unclear exactly why the planned exhibition of cartoons of the prophet Mohammed – scheduled to take place in London on 18 September and featuring far-right Dutch politician Geert Wilders – was cancelled two weeks ago. UKIP candidate and Sharia Watch founder Anne Marie Waters, the key organiser of the proposed event, claimed in the press that the cancellation resulted from a ‘real possibility that people could be killed’. Although no specific dangers were mentioned in the press, it is of course possible – perhaps even likely – that threats were made or could have materialised. It goes without saying that any such plans for, or acts of, violence should be condemned. But Waters, who says she discussed the event with the security services, has made clear that they did not force her to cancel. Perhaps other factors – such as the challenge of finding a venue willing to host it – influenced the decision more than she is letting on, and the failure is now merely being spun into a victimhood narrative. Behind the headlines, key political allies of Waters, one of whom lent the event a veneer of respectability, were also getting cold feet. One of the two other people mooted to speak at the exhibition alongside Waters and Wilders was unsurprising: far-right politician Paul Weston of Liberty GB, notorious for his frank admission of being racist. He remained committed to the exhibition even though Lord Pearson of UKIP reportedly decided against becoming involved and ex-English Defence League (EDL) leader Stephen Lennon (aka Tommy Robinson), an early enthusiast of the plan, was recalled to prison. The other person due to speak, a top lawyer who thinks people should ‘get f*cking angry’ about Islam, was less expected: Charlie Klendjian, in-house lawyer of telecoms giant EE, was secretary of an ostensibly mainstream and respectable group called the Lawyers Secular Society (LSS), which he re-launched in January 2013. Because of his involvement in the planned exhibition, Klendjian and the LSS were briefly profiled (on page 18) in Hope Note Hate’s recent report. This study highlighted how even former BNP and Britain First fundraiser Jim Dowson had condemned the event, fearing that Waters was trying to use it to spark a ‘civil war’. Dowson’s concerns stemmed from a meeting he had in June with Waters and two former figureheads of the EDL, Lennon and ex-funder and strategist Alan Ayling (aka Alan Lake). In January 2015, Waters had denied knowing Ayling, after Spinwatch highlighted his presence at one of her speeches. As Hope Not Hate observed, Klendjian is a close ally of Waters’, and spoke at the launch of Sharia Watch hosted by Baroness Cox in the House of Lords in April 2014. Here, his comments included describing what he sees as the ‘increasingly non-benign influence Islam is having on our way of life’. He even contributed to Sharia Watch’s first report and used the LSS website to promote it. Hope Note Hate wrote, though, that ‘there is no suggestion that Klendjian has associated himself with the calls for civil war’. However, while there is no evidence he attended – or even knew about – the meeting with far-right activists Ayling, Dowson and Lennon, a look at some of Klendjian’s speeches suggests he is indeed preoccupied with the idea of a ‘Coming Civil War in Europe’, a major theme in counterjihad discourse, viewed as inevitable because Islam and “the West” are held to be incompatible. Klendjian has argued, for instance, that if Sharia law is incorporated into the British legal system ‘we’ll have to fight to remove it, literally’. On another occasion – in the House of Lords no less – he stated that ’civil disorder or something akin to a violent revolution’ might be required to reverse its influence, predicting ominously at the end of the same speech ‘we can either fight this battle now, with our words, or we can leave it to the generation that follows to fight it with their blood’. More recently, at the University of Manchester – where Klendjian and Water’s appearance was opposed and challenged by students after Spinwatch raised the alarm about their dangerous rhetoric – Klendjian offered a similarly dystopian vision of a bloody future. As this video shows, he declared (at 4:07): ‘there is a problem and anyone who denies there is a problem is part of the problem. If we don’t solve this problem with words we’re gonna have to solve it with our fists, our children are gonna have to solve it with their fists, they’re gonna have to solve it with their blood’. He has also cited counterjihad author Bruce Bawer and directed readers to articles published by the Gatestone Institute (which specialises in anti-Islam articles with titles like ‘Islamic cannibalism’, ‘UK Islamic Takeover Plot’ and ‘Soon the Muslims will be Kings of the World’) on not one but at least two occasions. In February, Spinwatch contacted several members of the LSS to outline our concerns about Klendjian’s views. Those who replied included prominent lawyer David Wolfe QC of Matrix Chambers and Peter Fisher MBE. Though they were reluctant to unequivocally condemn Klendjian, we continued a dialogue about the appropriateness of Klendjian’s statements and associations, which Tell MAMA has also highlighted. It seems that his planned participation in the Mohammed cartoon event finally provoked opposition from at least some within the LSS. Initially, on 30 July, Klendjian posted a blog defending the decision to share a platform with Wilders and Weston but on 2 August he pulled out of speaking at the cartoon event (citing ‘personal reasons’) – yet claimed that the LSS remained fully supportive and would find a replacement speaker. However on Wednesday (19 August) he announced he was resigning as LSS secretary. Klendjian’s resignation came after he unilaterally signed the organisation up as a supporter of the planned exhibition, prompting some LSS members to complain, which brought about a vote on the issue. According to a leaked copy of the ‘no’ case, those in opposition stated their belief that the event was less about freedom of expression and more about ‘attacking a whole community’, said they believed the event would ‘irreversibly damage’ the credibility of the LSS and pointed out the difference between ‘advocating the right to free speech’ and ‘sharing a platform with bigots’. Although it is not known how many people voted, the ‘yes’ case reportedly won. But, according to Klendjian’s comments under this blog, at least two people then resigned. Indeed, though the organisation has been reported to have 100 members, from a grand total of eleven listed members on 22 July 2015, the number had dwindled, by late August, to just five. This implosion was likely a factor in Klendjian’s own departure. In his resignation letter he claimed that ‘any discussions I might have in the public domain about secularism will only ever be calm and well-reasoned’. However, a speech Klendjian gave in Hyde Park in October 2014 – in which he delivered a passionate anti-Islam diatribe – was anything but calm and well-reasoned. As academic Rasmus Fleischer observed, in a chapter of the 2014 book In The Tracks of Breivik called ‘Two Fascisms in Contemporary Europe?’, ‘anti-Muslim racism is typically articulated in an inductive way by generalising the behaviour of individuals, claiming that this behaviour is determined by “Islam” and that it is emblematic for all persons coming from a Muslim background’. In simpler terms, we might also speculate that if comments like ‘get f*ucking angry’ were made about a racial group rather than a religion (or religious minority) they could even constitute incitement. But Klendjian is not the only member of the LSS to trivialise anti-Muslim hate. Nor is the LSS the only secular organisation to have allied itself with Sharia Watch. 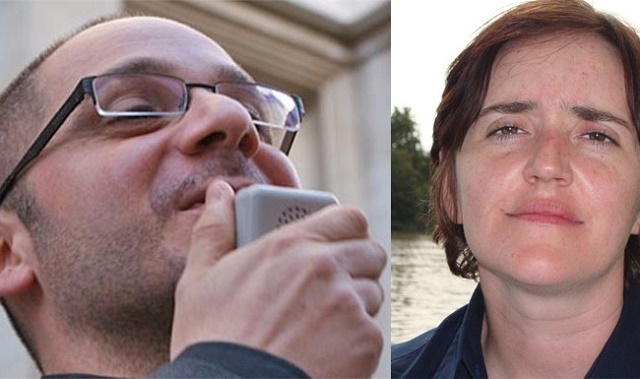 The National Secular Society (NSS), where Waters was a council member until April 2014 and director until June 2014, and which Klendjian remained involved in until at least November 2014, has both promoted Sharia Watch’s report and lamented the University of West London’s decision to cancel a launch event for it, after Spinwatch and others alerted them to its content. Waters has revealed that NSS executive director Keith Porteous-Wood, even attended the launch of Sharia Watch. 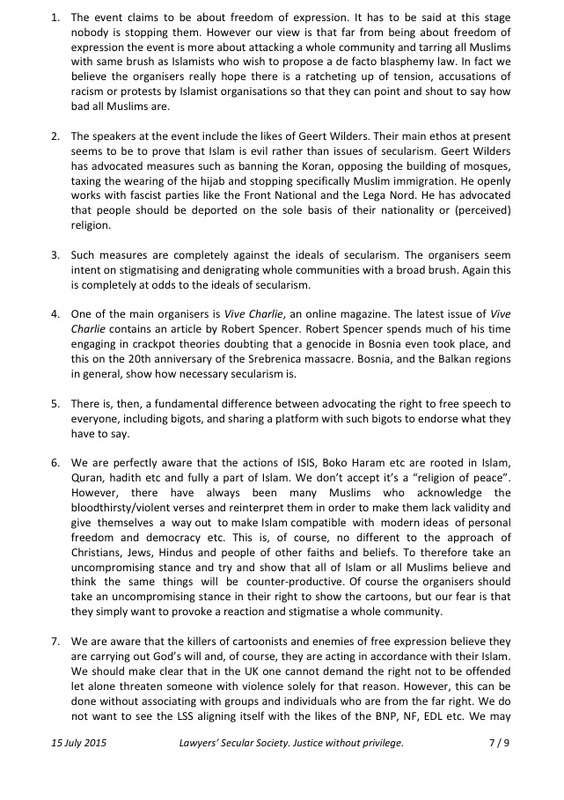 However, following criticism from Spinwatch about its links to Waters, the NSS governing council decided it wanted nothing to do with the Mohammed cartoon event, prompting Waters to condemn it for ‘left-wing bias’ and adding another nail in the coffin of the Mohammed cartoon exhibition. The saga highlights the need for secularists to call out racism within their own ranks – as some have done – and be wary of falling into the same Islamophobia as many of their new atheist allies. The far-out Far-Left: a response to Hilary Aked | First News Feed: One world. One page. The far-out Far-Left: a response to Hilary Aked | First News Feed – One world. One Page.